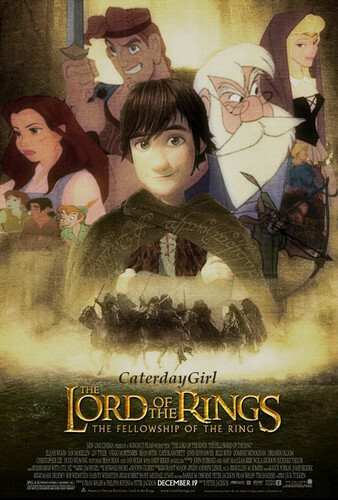 डिज़्नी LOTR Poster. this is my entry for the movie poster crossover contest. I put a lot of hard work and detail into this one.. HD Wallpaper and background images in the डिज़्नी क्रॉसोवर club tagged: disney crossover lord of the rings hiccup merlin belle. This डिज़्नी क्रॉसोवर photo contains मोबाइल फोनों के लिए, हास्य पुस्तक, मंगा, कार्टून, एनीमे, कॉमिक बुक, and manga. There might also be हस्ताक्षर, पोस्टर, पाठ, चॉकबोर्ड, साइन, साइन इन करें, समाचार पत्र, कागज, पत्रिका, अखबार, खपरैल, अख़बार, चीर, and पत्र.